The 20% pass-through deduction was big news for small businesses when the Tax Cuts and Jobs act was signed into law last year. In effect, this equates to not having to pay tax on 20% of your business’ income—resulting in a significant savings on your return! That said, the deduction comes with several qualifiers and conditions—making it far from a done deal for everyone. With tax return season just around the corner, let’s revisit this important tax reform provision and see what it could mean for you. Beginning with your 2018 tax return, you can take a 20% deduction of the amount of qualified business income, or QBI (includes domestic income from a trade or business) from a domestic business operated as a partnership, S corporation, sole proprietorship, trust or estate. The point is to give small businesses that don’t qualify for the slashed corporate tax rate another way to benefit from tax reform. For example, if you have $1 million in QBI but only $100,000 of taxable income, your 20% deduction will be on that smaller figure and not the QBI. And then you have to consider loss limitations, depreciation, interest… these and other factors play into the situation. Additionally, some limitations apply once a taxpayer’s taxable income exceeds the threshold amount. If your income is at or above $157,500/year (single filer) or $315,000 (married filing jointly), the deduction is limited to 50% of qualified wages or 25% of qualified wages and 2.5% of qualified property. Further still, not all non-C corporation businesses qualify. If your company is classified as a “specified service trade or business” (SSTB), it is excluded from the pass-through deduction if income is above the threshold. An SSTB is any trade or business in which the principal asset of the company is the reputation or skill of its employees or owners. Some such fields include health, law, athletics, performing arts, financial services, consulting and several other areas. Finally, the pass-through deduction is a temporary measure scheduled to sunset after the 2025 tax year unless Congress votes to extend it. So even if you do qualify, there is no guarantee that you’ll have it for the long term. And now that the corporate income tax has been reduced to 21%, you might want to review your company’s entity structure to see if converting to a C corporation is a better move for you. As you can see, while the pass-through deduction could be a major deduction in your favor, a great deal goes in to seeing if you qualify and then calculating the amount that you are due. It’s a complicated puzzle that could yield big results—if the chips fall in your favor. So using a business tax CPA isn’t just helpful for the pass-through deduction; it’s critical. 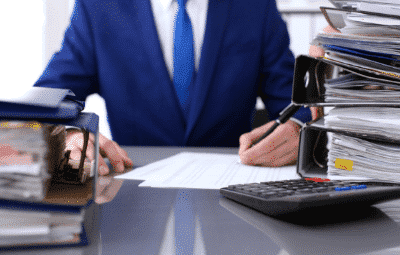 Not only can your accountant walk you through the web of regulations and exclusions, he or she can also help you decide whether an entity structure change is in your better interest. To know for certain whether you qualify the pass-through deduction, contact James Moore’s business tax CPAs. Not only can they answer this question, they will help you prepare any documentation necessary to take advantage of this new provision. Our business tax team can also go over your entity structure options with you and see where you’d come out ahead on your return.